Snoring is generated in the area of the upper respiratory system. Caused by acceleration of the air flow when the respiratory tract is cramped (pharynx), parts of the soft tissue start to vibrate and cause the snoring noise. The Silensor-sl belongs to the mandibular advancement splints. 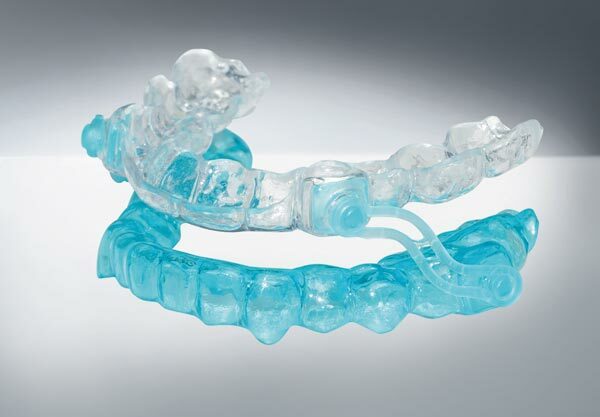 These devices prevent the lower jaw to fall back during sleep. Clinical tests give proof of the effectiveness of mandibular advancement splints, amongst them also the especially comfortable Silensor-sl. Further informations: Silensor-sl info / patient flyer. When is the Silensor-sl suitable? Up to 40 % of the population in industrialized countries snore. The decreasing muscle tone during the sleep causes a norrowing of the upper respiratory tract. This narrowing accelerates the respiratory airflow, thereby various structures in the area of the upper respiratory tract start to vibrate and cause the snoring noise. So snoring is a mechanical process that can be counteracted mechanically. Here the dental therapy comes into action. Light or primary snoring do not have consequences on health whereas the rhonchopathy, the abnormal snoring, does. Sleep apnea is, at a certain level of severity, a serious disease that may cause not only sleepiness during the day but also serious systemic diseases. The apnea is a total respiratory stop. 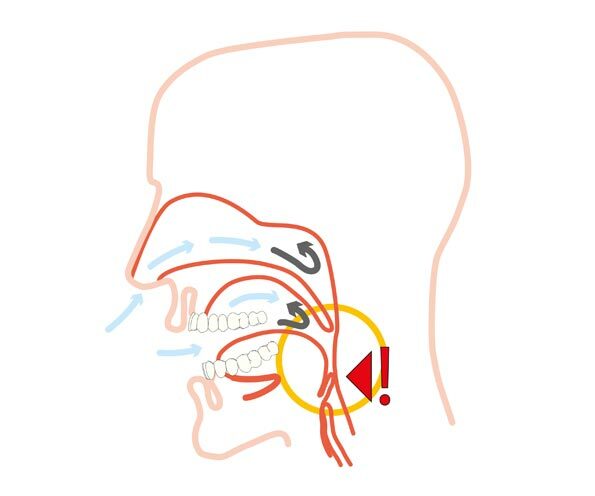 The obstructive apnea is a complete occlusion of the respiratory tract whereas in case of the central apnea the central respiratory reflex arrests. The hypopnea is a reduction of the respiratory flow by more than 50 %. The apnea/hypopnea index, AHI is the degree of the severity of the disease. An apnea/hypopnea lasts at least 10 sec. The apneas per hour are counted, 10 apneas per hour result in an index of 10. An index of 0 to 5 is normal, 5 to 10 is a light, 10 to 20 a median range and more than 20 a severe disease. An obstructive apnea is characterized by an interruption of the very noisy snoring (rhonchopathy). The central apnea, however, has no external signs. The Silensor-sl consists of one splint for the upper jaw and one splint for the lower jaw. The lower jaw is either held in a predetermined position or advanced by 2 connectors that are fixed laterally to the splint. The Silensor-sl thus counteracts the narrowing of the respiratory tracts. The velocity of the inspired air decreases and so do noise-generating vibrations of the soft tissues. With the Silensor-sl jaw movements are possible but no falling back of the lower jaw. With this function the Silensor-sl is a comfortable and at the same time effective snoreguard. 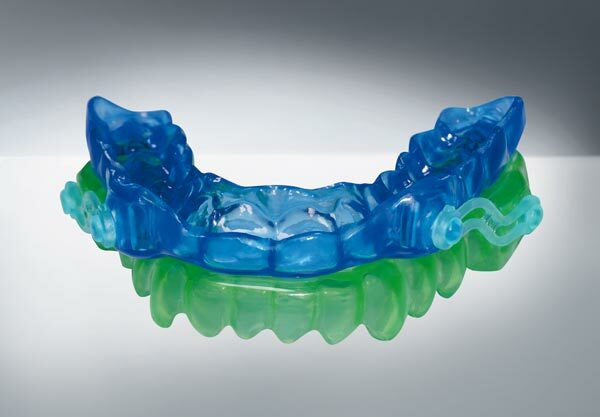 Clinical tests have shown that the advancement of the lower jaw considerably reduces snoring at more than 80 % of the patients and may reduce the apnea index at up to 50 %. 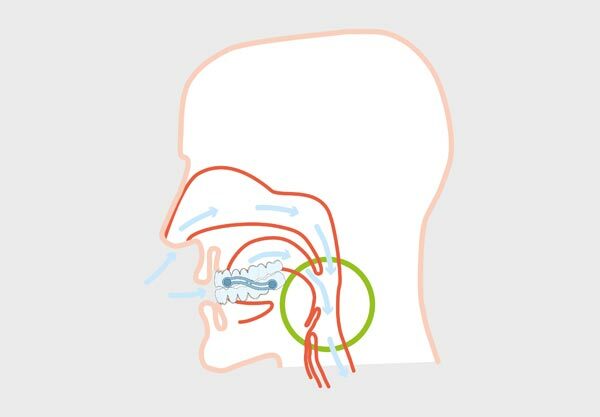 The Silensor-sl can be expected to be very successful since in almost all cases the noise involved in snoring is caused by constriction of the airways. Because of its compact design, the device does not inhibit breathing through the mouth. With severe corpulence a good success of the treating, however, is doubtful. The effectiveness will thus be increasingly reduced at a BMI (body-mass-index) of more than 30 and a neck circumference of more than 44 cm. The Silensor-sl cannot be used with edentulous patients. The dentist has to evaluate if the partial denture will provide adequate retention. 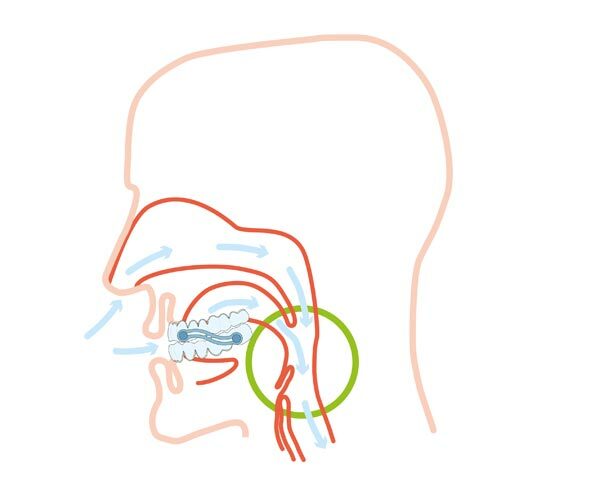 If a sleep apnea is suspected, the efficacy of the Silensor-sl should be assessed in a sleep laboratory considering the seriousness of this disease. Upon insertion of the Silensor-sl the patient may experience some tension. This will disappear normally in a short time. If the wearer of the Silensor-sl should realize tooth migration his practitioner has to be informed of it as quickly as possible. The dentist will then decide if the appliance can further be worn. After removal of the splint the patient feels more or less considerably a changed bite situation – the mandible feels slightly out of alignment. This condition will disappear in a short time and will have no consequences according to several tests. 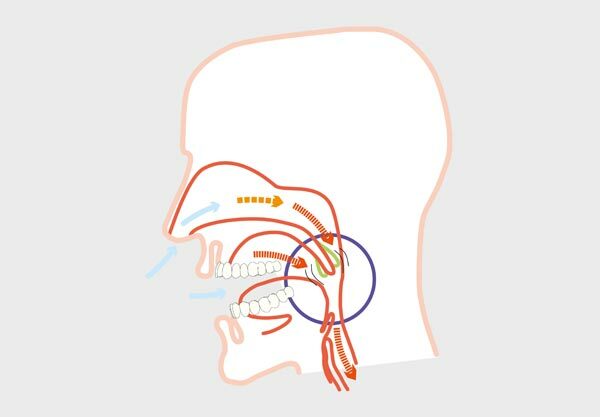 In the beginning of the Silensor-sl therapy there will often be increased salivation. This will, however, generally soon decrease again. By biting on the bite-help strip, the reorientation will be considerably accelerated. Silensor-sl - in case of bite problems in the morning, when the muscles have taken another orientation. This might last for a while, but will have no consequences. Card with connectors, spacer/holding pin, drilling shell, sl-protrusion gauge, measuring templates, spacer and anchor. The Silensor-sl set contains all materials and auxiliaries for the fabrication of two Silensor-sl including two Erkoboxes for keeping the anti-snoring splint and information material. During sleep muscle tone of soft tissues in the neck decreases. This narrows the pharyngeal area and the required volume of air must be inspired at a higher velocity and noisy vibration (snoring) of soft tissues is stimulated. 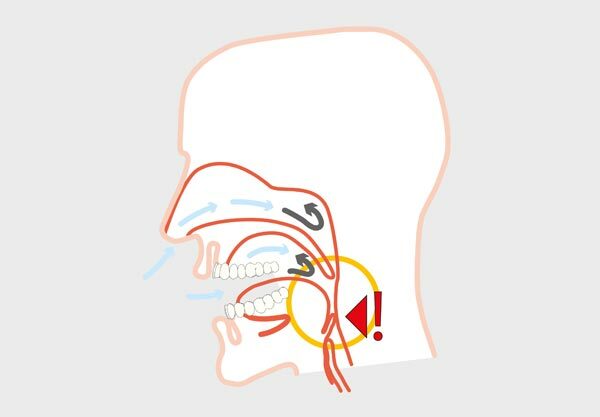 The Silensor-sl opens the pharyngeal area. The velocity of inspired air decreases and therefore the noisy vibration. With the Silensor-sl jaw movements are possible, the falling back of the lower jaw, however, is not possible. This function makes the Silensor-sl a both comfortable and effective anti-snoring device. 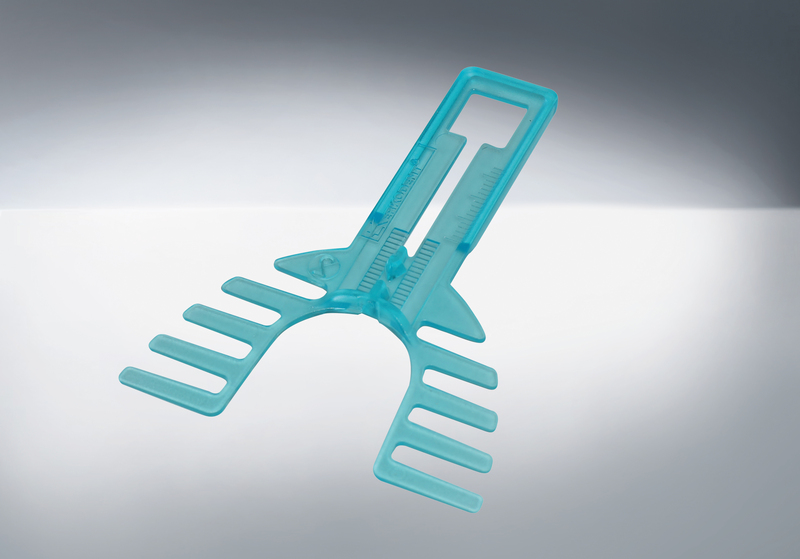 The construction of the sl-protrusion gauge enables in a most simple way to register the requested or recommended advancement of the lower jaw for the Silensor-sl. At high tours (20 - 40 000). Work without any pressure. Bur to drill the holes for the spacer holding pins in the fabrication of the Silensor-sl.